Water damage can be devastating for homeowners. The more you know about water damage restoration, the better you’ll be prepared. For more than 60 years, ServiceMaster Restore® has been cleaning and returning homes to their pre-loss condition using state-of-the-art equipment, advanced techniques and Institute of Inspection Cleaning and Restoration Certification (IICRC) protocols. When ServiceMaster DAK arrives at the home, we survey the extent of the damage and educate the homeowner using our MasterMomentsSM guide. Within 24 hours, we notify you of the scope of the damage. Understanding the classification is just the first step of restoring a home after water damage. After our techinicians determine the severity of the water damage and the class the damage falls into, we use the information we gain to begin the drying process. Excess water removal – We use various methods to remove the excess water including absorbing, draining, pumping and vacuuming. Evaporation – Evaporation involves changing the liquid water to vapor. Using equipment such as air dryers helps the water to evaporate more quickly. 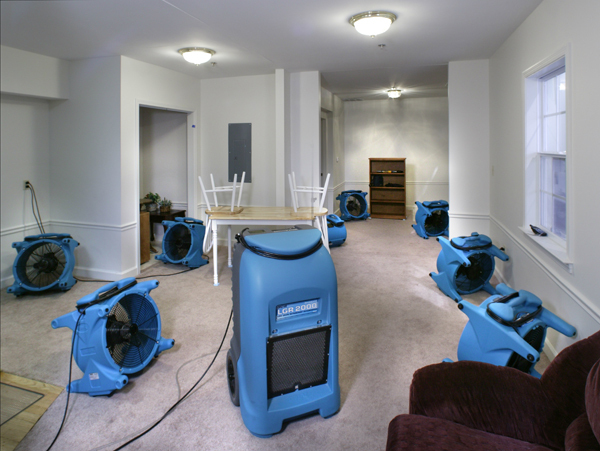 Dehumidification – The evaporation process leaves the air more humid, and humidity can settle into the home’s structure and contents, causing further damage. Dehumidifiers extracts the moisture from the air and expedites the drying process. Temperature control – Our technicians take atmospheric and moisture content readings that indicate if the area is drying, at what rate and what adjustments, if any, need to be made to expedite the drying process. In order to return affected areas to their pre-loss condition, a water damage restoration professional must begin this four-step drying process as soon as possible. Our technicians understand the complexities of water damage and have the experience and tools necessary to restore your home.